This text addresses some of the most fundamental and delicate religious issues. Therefore, it should be read, quoted and analysed in a mindful way. It is our human nature to keep precious things in a safe place when we have them. We can tell ourselves what are the most important objects we own by examining where and how we keep them. For a practising Buddhist, an image or a drawing of the Buddha and other Buddhist symbols are important objects which enhance his faith and remembrance of the teachings. The time and effort required to keep the shrine clean and replenished with flowers and other offerings is considered a skilful activity to focus one's mind in the spiritual practices. It will be more than interesting if we can realize the reason why we arrange and keep our things around the house reflect our state of minds. It appears that things can and have meanings as much as our minds can project upon them. We are not going to tell our children that their toys are not real and have no significance. Your 15 year old Holden may seem unreal when you see your friend's new sports car. When you walk into a Buddhist shrine, you can tell that your heart-felt devotion or lack of it, is expressed through your body language. Just as all objects have some kind of power or influence to our minds, the serene Buddha image and nicely arranged flowers and aromatic incense cause our minds to reflect within ourselves in the deep meditative concentration. The positive impact of seeing a Buddha image on our minds cannot be underestimated. 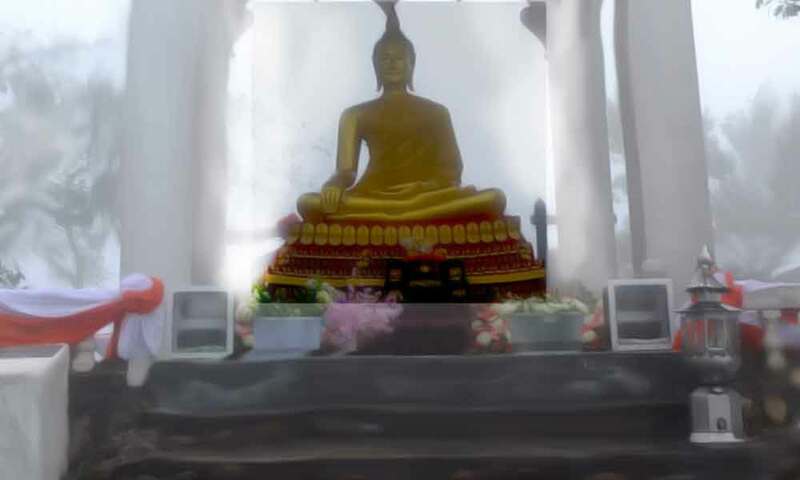 The Buddha images are purposely consecrated and blessed to radiate the spiritual power and blessings so that whoever happen to see them experiences the positive feeling through the medium of the statue. As long as our minds are dependent upon sensory objects, it is important to have appropriate objects conducive to our minds. A Buddhist would find it inspiring and motivating to see a Buddha image, which helps him to remember the qualities of a Buddha and his teachings. He or she shows devotion by bowing down, offer flowers and light a candle or two before taking a seat to meditate. Bowing down purifies pride and cultivates humility. One cannot meditate properly if one cannot let go off such negativities. The shrine enables us to remind ourselves to surrender all the negativities in order to feel peace, serenity, tranquility, freedom and light. Keeping the shrine clean represents the sanctification of our spiritual self and acknowledges the purity of an enlightened being. In Tibetan Buddhist shrines, many water bowls are arranged on the altar to cultivate its manyfold qualities, fluidity, continuity, universality and purity in our practice and faith. Flowers, candles, fruits and incense are brought as offerings to the Buddha and they give us an opportunity to practise generosity and test our understanding of the Law of Karma. When you come to attend a session, rearrange the offerings on the altar, clean the water bowls and fill them with fresh water [start from left to right], remove withered flowers and old fruits and light a candle before you take a seat. You will be surprized with the difference it makes to your meditation. Water: May I and others cultivate pure and continuous faith in our spiritual practices! Flower: May my heart blossom with the gift of love and compassion so that I can share it to others and grace them with happiness! Incense: May all the negative vibrations accumulated due to my selfishness, ignorance, greed and hatred be purified by the aroma of the practice of morality! Light: May the light of understanding, faith, awareness and wisdom illuminate the darkness of confusion, mistrust and all defilements! Perfume: May the aroma of unshakable faith and confidence have the ability to please anybody who come in contact with me! Fruit: May I be able to satisfy the needs of sentient beings by sustaining the mind with the abundant food of meditation and wisdom! Now, you can practice this when you go to the center next time or visit a temple, or you can perhaps rearrange the Buddha image in your house to enrich the spiritual vibration around your house. Source: UNDERSTANDING THE SIGNIFICANCE OF A BUDDHIST SHRINE by Lama Choedak [reprinted with permission from the CLEAR MIND QUARTERLY NEWSLETTER No 6, Nov 1990-Jan 1991] Copyright 1993 (c) by Lama Choedak Yuthok, Sakya Losal Choe Dzong, Canberra. This text has been reformatted at Hinduwebsite.com by Jayaram V. This document can be acquired from a sub-directory coombspapers via anonymous FTP and/or COOMBSQUEST gopher on the node COOMBS.ANU.EDU.AU.